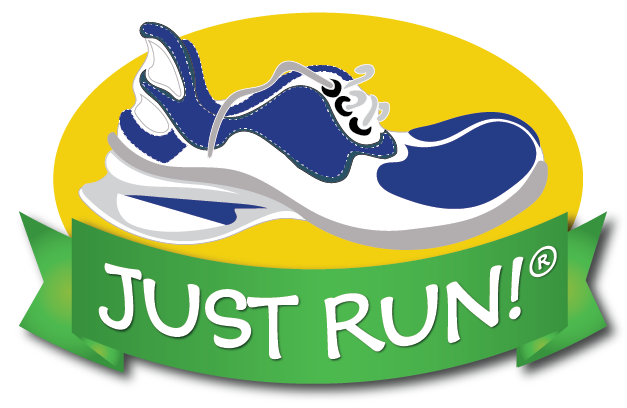 Whe you run with your children and encourage their physical activity, they receive double mileage in the JUST RUN program. You and your child also share valuable healthy time together. Makes you look and feel great. Helps you keep a healthy body weight. Reduces stress and helps you relax. It is a great way to have fun with family and friends. Children should exercise and be active for at least 60 minutes a day. This can be done all at one time or breaking it up into several 10 and 15 minute periods. You can be active in many ways and do activites like running that exercise your heart and lungs, make you stronger, and improve your body's flexibility. At home you can walk, run, bike with a friend or family member. You can play at the park or at your school. Gardening and dancing are even good forms of exercise. Start easy when you begin an exercise program. Start with 10 or 15 minutes then work up gradually to 60 minutes. Every day watch what you eat and include colorful foods that help you eat the 5 to 9 servings that your body needs for good health. Each week try to try a new colorful fruit or vegetable. Do your exercise with friends and try to get them to do the 5 to 9 colorful fruits and vegetables every day with you. 1. Cut down on the amount of time you watch TV, play on computers, sitting down, and surfing the internet. Get up and be active. You can exercise or stretch while you watch T.V. 2. At least 2 or 3 times a week, and every day if you can, you should stretch the muscles in your arms, legs, shoulders, legs, and other parts of your body. This improves flexibility and strengthens your body. 3. At least 3 to 5 times a week, and every day if you can, you should walk, run, bike, dance, play soccer, play basketball, or some other game that gives your heart and lungs exercise. 4. Walk as often as you can and make physical activity part of your daily routine. 5. Mix up the things you do to be active. Try new things. Challenge yourself with new goals. Before there were stopwatches, races, tracks, and shoes, men and women ran for one reason; to SURVIVE!!! An old story says that "every morning in Africa, an antelope wakes up. It knows it must outrun the fastest lion, or it will be killed. Every morning in Africa, a lion wakes up. It knows it must outrun the fastest antelope, or it will starve. So it doesn't matter if you are a lion or an antelope, when the sun comes up in the morning, you'd better be running!" Men and women had to run to hunt their food and to run from animals. From the beginning we were all made to run. There are few things more natural than running through a field or through trees either chasing or being chased. The only measure of success in running was whether the hunted reached safety before being caught by the hunter. Running as a sport evolved from this competition to survive. The best hunter was often the fastest runner. In ancient Egypt the King had to run the same long distance every three years just as fast as he did before in order to keep his crown. The first event on the first Olympics in Greece more than 2,700 years ago in 776 B. C. was a footrace of about 200 yards. The Greeks loved running and said in Greek - mens sana in corpore sano - a sound mind in a sound body. Fast runners were treated like Gods. The ROMANs made it easier to race certain distances, like the mile, as they measured their roads and put in markers at each mile. A mile was the distance it took a Roman Soldier carrying full battle gear to travel 1,000 two step strides. In the 1600's the English while travelling long distances on Roman marked roads with mile markers started having races between markers. Each city had its fastest running heros and they used to race against each other for City and National pride. Soon other distances were used to race and it became quite common to see footraces. But it all goes back to men and women being made to run and survive!!! Smoking does horrible things to your body and likely will kill you. Every 8 seconds, somewhere in the world, a person dies from tobacco related causes. Tobacco products are the only legal consumer product that is harmful when used exactly as the manufacturer intended. Each year 3.5 million smokers in the world die from tobacco related causes. More people die from tobacco related illness in the United States each year than from car crashes, alcohol, homicides, fire, illegal drugs, and Aids combined. Smokeless tobacco and chewing tabacco are just as dangerous as smoking tobacco. Second hand smoke in the air causes cancer and premature death in 3,000 non-smokers each year. Stay away from smokers. Everyone can be a HERO by training and improving their fitness and their running. All you have to do is JUST RUN. Each time you run you get better and faster and improve your health. It is important to be consistent and try to run or walk or move every day. You will get stronger and feel better. George Sheehan said, "Running teaches everyone to be a HERO. A Hero is one who lives by their own decisions and their own choices. When I train my body by running I also train my heart and mind as well. The effort and energy I use in training is matched by the effort I use in every other area of my life. When I run and train what follows is self esteem. I feel good about myself. I become a Hero and we were all meant to be heros. Having money, ability, talent, and possessions count for very little. It's the EFFORT and HARD WORK and TRAINING that makes me great." A very wise man named George Sheehan said, "There are as many reasons for running as there are days in the year." Here are a few of them. Running is FUN and makes you healthier. Your body was meant to move and be active. You don't have to move or run fast, but you do have to be active and move your body. You should try to run or walk each day for 30 minutes. Running improves your heart, lungs, and flow of blood through your body. It makes your cardio-vascular system the best it can be. Running helps you in other sports. No matter what sport you do as you get older, running will make you better. Running prevents weight gain and being overweight. Running improves your immune system and makes it harder to catch colds and other diseases. Running actually gives you more energy. For every minute you sit in front of the TV or the computer make sure you run/walk/or be active as well for the same amount of time. Running can actually make you smarter. Studies show that improved blood flow to the brain because of running actually makes your brain work better and makes you smarter. Running makes you feel better and be happier. An active body improves your mood and the way you feel the whole day. Running is something you can do with your friends or by yourself. You can talk and joke and laugh and tell stories with your friends while you run. Or sometimes you just want to run by yourself and be able to think about things yourself and running allows you to do that as well. Running allows you to get close to nature. You can run on trails, in parks, on grass, on roads, and enjoy the trees, flowers, hills, and other sights that you can only see while running or walking. If you want you can run races and see how fast you can go. It is exciting to compete and run against others and see how far and how fast you can run. It's the oldest sport and the most exciting!